Singapore doesn’t have many beaches for you to lounge around on despite being a sunny tropical island. However, if you’re determined to soak up the sun and waves without hopping on a plane, here’s a quick rundown of Singapore’s best beaches – plus the best restaurants and cafes to chill out in! Tanjong beach is the ultimate dog lovers’ paradise – it’s the place people usually take their dogs for a swim and a stroll (except the adorable pups are usually too excited to just stroll at a leisurely pace), so be prepared to have the time of your life! Bring your fur children along and grab a snack along with a cocktail at Tanjong Beach Club while soaking up some sun rays on lounge beds on soft white sand. Sit back and relax with some Cider Battered Fish & Chips ($28) with a side of fragrant Truffle Fries ($10), and a cold Piña Colada ($23) in hand and feel all the stress and tension of the outside world melt away. Remember to slap on some sunscreen! Palawan is Singapore’s child friendly beach, full of activities to keep children occupied for an entire day (or until they exhaust themselves from playing and swimming). Stroll across the suspension bridge to the little Palawan Island (which is also where Asia is closest to the Equator! ), and on the other side you’ll be rewarded with a viewing platform that gives you a bird’s eye view of Sentosa. 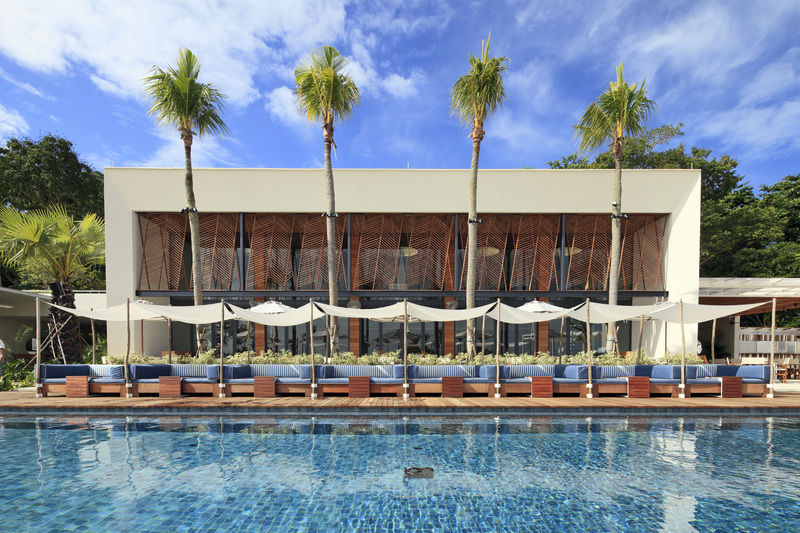 Grab a seat at FOC Sentosa for delish Spanish fare – there’s even a pool by the bar! Imagine goggling at a breathtaking pink and purple-hued sunset while sipping on a glass of FOC Red Sangria ($16) and digging into a Squid Ink Paella ($40 for 2) – talk about perfection! Siloso Beach is truly where the action’s at – this is definitely the place for you if you’re someone who likes to party, or if you’re the type of person who’s constantly on the move! You can surf a man-made wave at Wave House and chow down on their 1-Foot Garlic Baguette ($5.50) or the all time favourite ‘Wipe Out’ Pizza (topped with beef pepperoni, smoked chicken, chicken bratwurst, mushrooms, capsicum, pineapple and olives – $17.80) if you’re feeling peckish, or head over to Bikini Bar for a ice cold glass of Bintang beer! If you’d prefer to just chill out, there’s something here for you too: Coastes offers a casual, laid-back beachy vibe where the sunbeds and deck chairs are placed right to the water’s edge. So sit back and relax with a good book, and dig into their delish Big Bad Wolf Pizza (bacon, roast chicken, capsicun, mushrooms – $25) or the flaky beer-battered Coastes Fish Burger ($20). You can also sprawl out at one of Ola Beach Club’s many sundeck chairs for some Hawaiian goodies – like their Kalua Pig Taco ($25) and Lomi Lomi Salmon ($16). Craving some Indian food? Kurry Korner’s got you covered with their hearty Chicken Tikka Masala & Butter Chicken ($17.60 each) that you can wash down with a refreshing glass of Mango Lassi ($6.60). Drive a little further down to the luxurious Sentosa Coast Marina for a breezy row of restaurants and cafes reminiscent of Croatia’s Splitska Riva (only my favourite place in the entire universe) where you can settle down with a tall iced latte and almost teleport from the hustle and bustle of Singapore’s dizzying city lights to the jewel toned Adriatic seafront in a matter of seconds. Visit Sabio By The Sea for great tapas – the El Pulpo (grilled octopus leg, $24) and Vieiras en Salsa de Cava (sea scallops with white wine sauce, $22) are seriously top notch; or Miska Cafe for yummy Falafel ($19) or Shakshouka ($20) – you can’t go wrong with Mediterranean fare! There’s also Greenwood Fish Market if you’re feelin’ seafood – the Cold Seafood Platter ($99) consists of a steamed ½ Boston lobster, marinated Yellowfin tuna, freshly shucked oysters, New Zealand green lip mussels, littleneck clams, tiger prawns, and in-house apple wood cold smoked salmon, and is great for sharing! Fancy some chewy New York style breakfast bagels? Get The Central Park sandwich ($14) stuffed with spring onion cream cheese, lox, and a smattering of capers from Schmear – perfect anytime of the day. If pizza’s your thing, BIG FAT MAMA’s One Metre Pizzas are bound to satisfy! There’s truly something for everyone here – so fret not if you can’t jet off for a beach holiday anytime soon; just head down to Sentosa and let the golden sun and salty air whisk you away to paradise. SIN-ful-LEE Indulgent Meals @ Sin Lee Foods! Sunday Folks – Savour Some Spring Specials!